I was recently in Chicago and decided to get off the beaten path and visit the Oriental Institute at the University of Chicago. It’s a great, albeit small museum covering Mesopotamia, Persia, Egypt and other ancient near Eastern civilizations. One exhibit area is domonated by pieces from the court of King Sargon II who ruled Assyria from 721-705 B.C. In the center is a 16ft tall winged bull with a human head. This sufficiently impressive piece along with its twin would have guarded a city entrance. Looking more closely at the bull figure, it appears to have been made for viewing from very specific angles and not so much in the round. In the image above, the bull has four legs when you look straight on, but if you move 90 degrees, there are two symmetrical legs under the head. From the right angle, you can see that there are 5 legs! This protective bull genie has an extra leg! 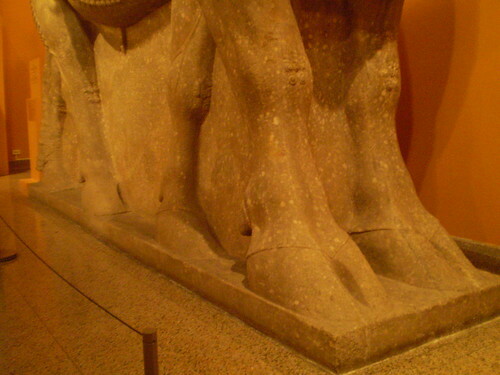 The Louvre also has some 5-legged Assyrian human-headed winged bulls. It just goes to show that you should look carefully at art.